Filomeno 'Boy' Codinera was given a Lifetime Achievement Award by the Philippine Sportswriters Association this year. FILOMENO “Boy” Codinera, one of the greatest baseball and softball players of the Philippines, has passed away. His son, PBA legend and Arellano basketball head coach Jerry Codinera, made the confirmation on Wednesday morning. Codinera was a member of the Philippine team when the country won a bronze medal in the 1966 World Amateur Baseball Championship in Hawaii. He also made his mark in softball and his accomplishment of hitting seven consecutive doubles in the 1968 World Softball Championship in Oklahoma made it to the Guiness Book of World Records. Codinera was also a member of the Canlubang Sugar Barons in the Manila Bay Baseball League, and also coached several teams including Adamson in the UAAP. 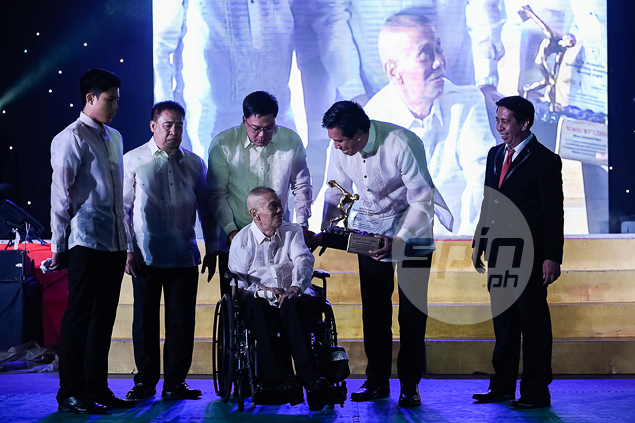 Earlier this year, Codinera received a Lifetime Achievement Award from the Philippine Sportswriters Association, a plum he personally received despite being on a wheelchair after a second bout of stroke.